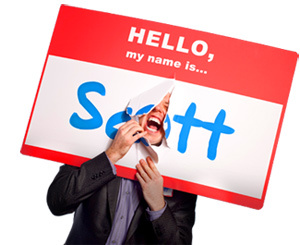 Getting the Maximum Marketing Mileage Out Of Your Nametag - HELLO, my name is Scott! As a small business owner, you must always explore creative ways to promote your products or services. An effective yet underappreciated tool to keep your company ‘on stage’ is your nametag. Especially when you attend meetings, events or if you’re out in the field as a representative of your company, your nametag is your best friend. Not only does it remind people of your name (who forget your name 10 seconds after they shake your hand anyway), but it advertises your business. Think of your nametag as your own personal billboard. And with that in mind, follow these steps get the maximum marketing mileage out of your nametag. If you’re a small business owner or entrepreneur and you don’t have your own custom nametag, you will miss out. Imagine you attend your Chamber of Commerce meeting and you get stuck with the obligatory, computerized, faded-font, barely-sticks-onto-my-lapel Avery piece of junk. You will not stand out. You will not promote your business. And other members will not know who you are or how you give value. 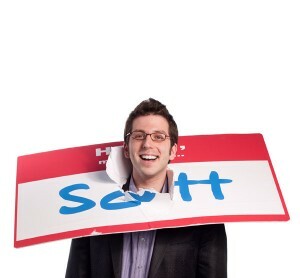 Try this: at your next meeting, sit by someone in real estate – those people know how to wear nametags! If you want a professional nametag that will effectively brand you and your business, consider a small investment in custom engraving. I once started a conversation and made friends with a lady at a meeting of the National Speaker’s Association because she had the biggest, most beautiful…nametag…that I had ever seen! She then told me the name of the St. Peters company who customized her nametag – and I drove out to their shop that day! For more information, go to Incredible Engravings. Think of yourself as a taxi driver. If you cruise down the street and you want to attract customers, don’t shut off your ‘on duty’ lights. Be available at all times for the people who need your services. Because you never know around which corner your next customer awaits! All billboards for McDonald’s have similar components: the golden arches, the food, the lifestyle images, the slogans, etc. They are consistent because effective advertising campaigns coordinate their branding efforts between mediums. Therefore, since your nametag is just like your own billboard, the font, color, logo and company information that appears on your nametag should be consistent with the existing brand of your business. As a result, when people meet you, look into your eyes and then look at your nametag, everything synergizes together as one valuable entity. A great example of someone who uses a nametag as a branding tool is my friend Tom Terrific. Tom is a speaker, trainer and coach whose company is called Terrific Presentations. Not only do his name, company and programs revolve around the word ‘terrific,’ but his nametag simply says, ‘Tom Terrific.’ And nobody ever seems to forget Tom. Why? Because he’s terrific – and he has the nametag to prove it! Your nametag immediately identifies you as an ambassador of your company. As such, it holds you accountable for your behavior while you wear it. Your nametag is like a logo shirt – it should be the personification of your company’s culture. So wear it proudly. It helps you maintain a consistency between your performance and the mission of your business. My friend Bob Kane, a Financial Representative for Northwestern Mutual. wears his shiny, sleek, silver nametag on the lapel of his elegant suit every day. It looks professional and meticulous. And just like his nametag, Bob is professional and meticulous. Bob is elegant. Now that is an example of how to be an ambassador. I know, I know – nametags are silly and annoying. They ruin your clothes. They diminish your anonymity. They draw unwanted attention to certain areas of your body. But, what if you wore a beautiful, customized nametag that differentiated you? What if…your nametag offered a small amount of personal information that made you more approachable? And what if everyone knew you and how you are able to help them? Then, the only people who will look silly will be those who don’t connect and engage with each other – the people who don’t get the maximum marketing mileage out of their nametags. What’s the best personalized nametag you’ve ever seen?